The Vatican Museums and the Sistine Chapel are the most visited attraction in Rome! 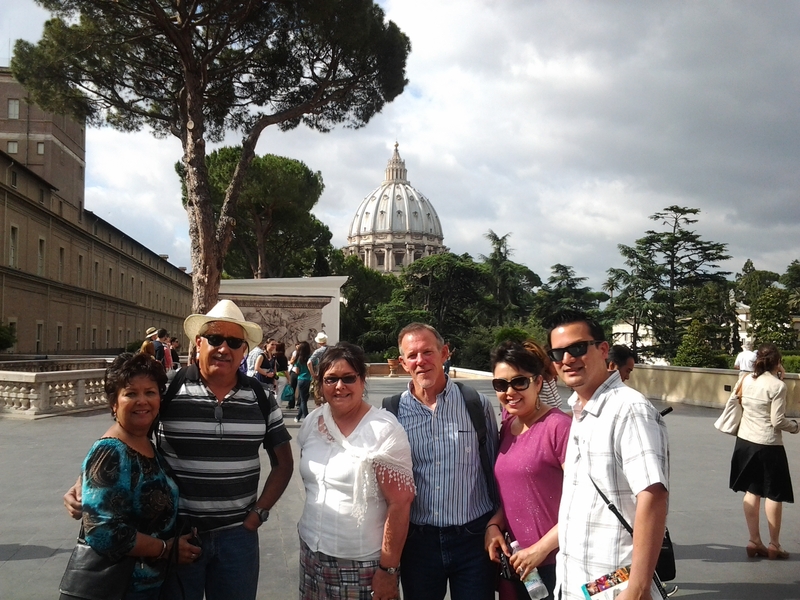 More than 15000 people go to the Vatican everyday wandering through the 5 miles of exhibits and galleries. It is easy to get lost and overwhelmed! The best way to see the Vatican is by taking a private guided tour that will make you see the highlights, save time and avoid stress. Our licensed expert English speaking guide will take you to the Gallery of Ancient Roman Sculptures that includes the famous statues of Apollo and Laocoon. Then we will visit the Rooms of Animals, the Hall of Muses, the Greek Cross Room, the Gallery of Bandelabra, the Gallery of Tapistries, the Gallery of Geographic Maps, the Rooms of Rapahel and finally the Sistine Chapel with Michelangelo’s most famous paintings: the Last Judgment and the Creation of Adam. The tour will continue to the Basilica of St. Peter to see the Tomb of John Paul II, the Pietà by Michelangelo and many other famous artworks. The tour takes a little bit more than 3 hours and we will skip entry lines and noisy groups!! It is a high quality private guided tour in one of the true wonders of the world. Traveling isn’t just about visiting new places, but immersing yourself into their culture, food and flavors. One of our English-speaking drivers will meet you at the lobby of your hotel as you prepare to begin your trip through the Sorrentine hills and coast with breath-taking panoramas. The first stop will be in an old olive-press named “Gargiulo” in Sant’Agnello, Sorrento, where you will walk along the cultivated crops and the old Mill, to learn the secrets of the oil manufacturing process. You will taste different types of oil, like the oil spicing with Sorrentine oranges and savouring with dark chocolate. You will get ready to discover Sant’Agata dei due Golfi, a small borough of Massa Lubrense which overlooks both the bay of Naples and Salerno and faces the Isle of Capri. It is rich in Lemon gardens from which it produces the lemon liqueur “Limoncello”, a real treat for your taste buds! As lunchtime approaches you will stop in the square of the old Schiazzano hamlet, “Da Francesco”, a typical restaurant located in a ‘700 old palace. Its double entrances recall the restaurant’s story through an old “Salumeria”. Here, you will learn the secrets of making homemade pizza with fresh ingredients and a lot of heart. You will also have the chance to eat some homemade cakes and deserts made by the pizza-maker’s wife (as well as some local wine, if you prefer). As soon as you wish, you will go into Sorrento and stop at “A Puteca e Masaniello”. This charming “Salumeria” (deli/restaurant) where you will experience all of sorrentine aromas and flavors and great delights like “parmigiana di melanzane” (eggplants), prosciutto and a wide variety of cheeses. You will see how to make a good Mozzarella and then enjoy a taste of it stuffed with vegetables like eggplants, squashes. 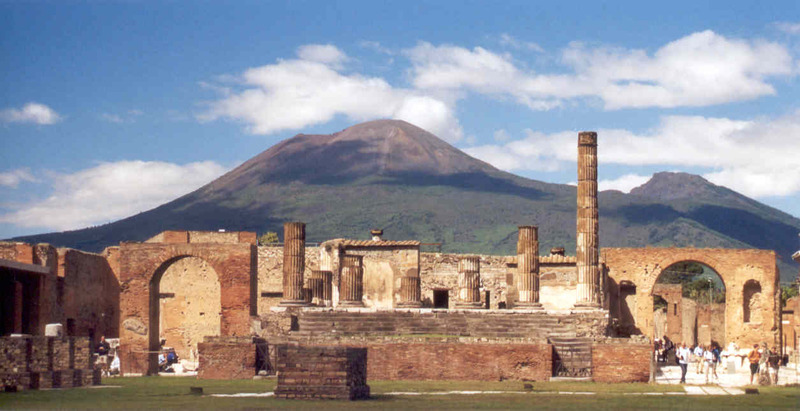 Visit the UNESCO World Heritage Site of Pompeii and the volcano that unleashed its fury on the city in 79 AD—Mount Vesuvius. You will see how big the tragedy was when the Volcano erupted more than 2000 years ago, preserving intact all the other towns around the Vesuvius with its unmistakable shape overlooks the Gulf of Naples. An English speaking driver will meet you at the lobby of your hotel or at the exit of your cruise ship to drive you to Pompeii and visit the ruins. You will get the feeling to plunge in the past, discovering how old Romans lived: the thermal baths, the theatre with marble decoration, the “pleasure house” and the shops along the avenue of Pompeii . After the visit of Pompeii , you will have a chance to taste the local cuisine and as soon as you get ready to discover the Vesuvius, the car will drive you up there to start a walking to reach the crater and admire the view! Your journey will ends here and the driver will take you back to your hotel or at the port. If you are tight on time this tour is the one for you! In one day you will have the chance to combine the natural beauty with ancient history as you visit Positano, Sorrento and Pompeii. 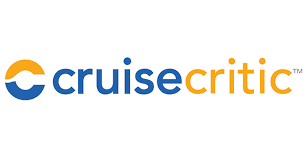 An expert driver with a luxury car will pick you up at the lobby of your hotel or at the exit of your cruise ship. 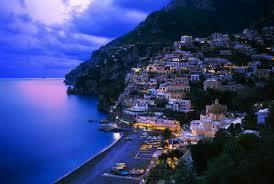 The tour begins with a drive along the Sorrentine Peninsula as you travel to the colourful town of Positano. A charming community with its pastel houses cascading along the rocks of the mountain. You will enjoy the beautiful view of the Volcano Vesuvius facing the bay of Naples. Crossing the Mountain you will drive through very narrow and winding roads where you can take photos of breathtaking sceneries before arriving in Sorrento. Its cliff-top position overlooks the sea, bustling port, picturesque bays and panoramic views of the Amalfi Coast and surrounding hills. It’s quite the little jewel. The tour continues with a stroll through the town where you will have the chance to admire the Cathedral and its elegant majolica clock and see one of the most scenic places “Villa Comunale” with its glimpse on Punta Campanella and Capri Island. 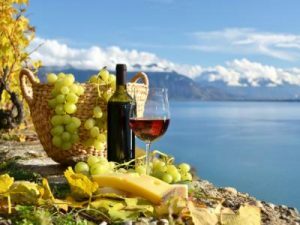 You will next enjoy free time and lunch in one of the typical restaurant of Sorrento and taste delicacies like “ Mozzarella”, ”Spaghetti with tomato” and drink one of the best liqueur of the coast : “Limoncello” made by Sorrento Lemons. 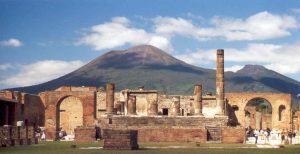 Last, but not least, you will visit Pompeii to see how in 79 AD the entire town of Pompeii and its inhabitants were buried under ash of Mt Vesuvius’ eruption. On this guided tour, you will discover the everyday life of the Imperial Age and explore fascinating Pompeii attractions such as the Forum, formerly the civic center of Pompeii that supported buildings for business, religion, and the local government. See the Lupanar – the official brothel of ancient Pompeii – and the Thermal Baths a place for people to relax and socialize. The island of Capri is one of Italy’s most well-known celebrity hang outs. What better way to experience then through the eyes of our Italian and English speaking Tour Guide! 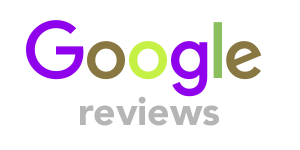 No Need to worry about times, trains, taxi’s or translations: we do it all for you!! The day begins after your private guide has lead you from your hotel or cruise ship to the jetfoils to Capri’s main port Marina Grande . Here we make our way directly to the Blue Grotto which is open one day out of four. 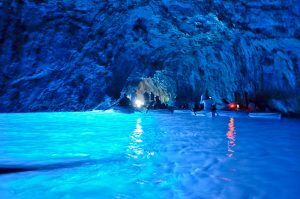 The Blue Grotto or the Grotta Azzurra is a rich and thrilling experience that only comes once in a lifetime. With our services there is no wait to see this World’s Natural Wonder. *Please note this is weather permitting. Next in our air-conditioned mini bus or white taxi convertible we head up to Anacapri via the “Oh My God Road” (the name explains it all!). Along these twists and turns you can view the natural lemon groves and the villa’s mansion and hotels of those lucky enough to live on this exclusive island. Anacapri offers many fantastic views and experiences. Whether it’s relaxing on a chairlift to Mount Solaro 589 meters high or touring and learning the history of Villa San Michele, you will understand and appreciate the lifestyle of this island. While enjoying the views of the Amalfi Coast, Naples and Capri you also will have free time for lunch or shopping. Look for the famous custom shoe-maker of the island. These sandals are Capri’s pastime! Next stop, back to the main center to La Piazzetta. As a celebrity hangout you will be sure to find the world’s best shopping and cuisine. You also are just steps away from Capri’s island made perfume. Carthusia is a man and women fragrance going back to the Roman times! After some more free time we make our way down the famous streets to the Garden of Augustus. The gardens are full of beauty and life with spectacular views of the coastline. 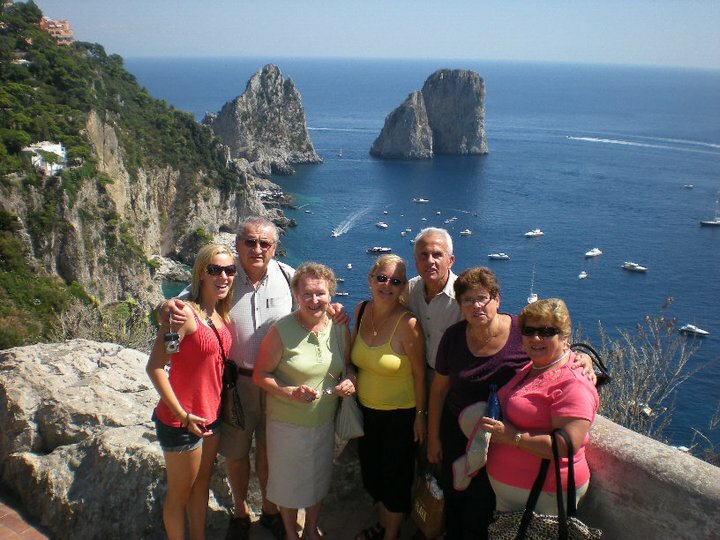 The Faraglioni rocks in the sea are just one of the many views from this photo point! Following the gardens it’s time to grab one last lemon granita as we make our way back to the main port of Marina Grande on the railway. Capri’s funicular (railway) will be the perfect way to end the evening with a ride through the lemon groves.